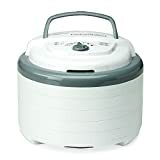 With nearly 2,700 5-star reviews at the time of this writing, the NESCO FD-75A Snackmaster Pro Food Dehydrator is by far the best-rated dehydrator on Amazon. It also might be the one awesome device missing from your kitchen setup. You’ve got an Instant Pot and an air fryer, and you’ve got the crazy $69 device that makes sure you cook steak perfectly every single time. Now you need a dehydrator, and this is the one to get — especially while it’s on sale. Trust us, you’re going to go nuts with this thing and dehydrate everything you can get your hands on!